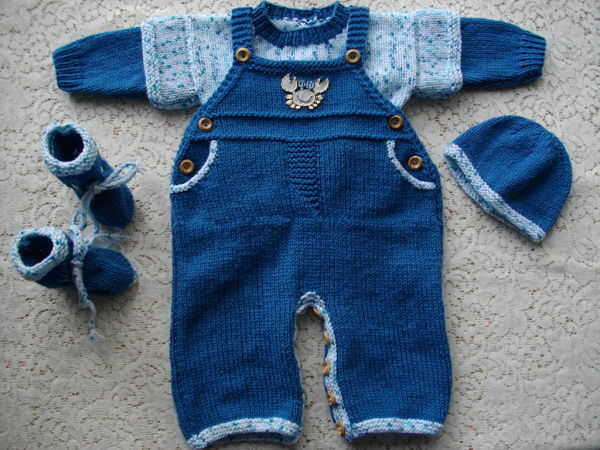 Instructions for a reborn or baby dungaree set in DK yarn. The set comprises of a crew neck sweater that fastens at the back, top, side and inside leg fastening dungarees, beanie hat and bootees. 150g 4ply yarn in main colour A, 100g contrast colour B, 20 buttons, 3 stitch holders, 1 x pr 2.75mm needles making a tension of 30sts and 38 rows to 10cm square over stocking stitch. 200g 4ply yarn in main colour A, 100g contrast colour B, 20 buttons, 3 stitch holders, 1 x pr 3.25mm needles making a tension of 28sts and 36 rows to 10cm square over stocking stitch. 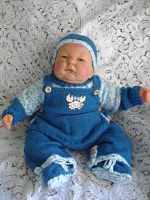 200g 4ply yarn in main colour A, 100g contrast colour B, 20 buttons, 3 stitch holders, 1 x pr 3.75mm needles. OR use dk yarn and 3.25mm needles making a tension of 26sts and 34 rows to 10cm square over stocking stitch. 200g dk yarn in main colour A, 100g contrast colour B, 20 buttons, 3 stitch holders, 1 x pr 3.75mm needles making a tension of 24sts and 30 rows to 10cm square over stocking stitch. 250g dk yarn in main colour A, 150g contrast colour B, 20 buttons, 3 stitch holders, 1 x pr 4mm needles making a tension of 22sts and 28 rows to 10cm square over stocking stitch.